Home / Gemstones Enciclopedy / Peridot Gemstone. Was Cleopatra blatantly cheated? Peridot Gemstone of August and 16th wedding anniversary Gemstone. It could only be the Gem of August, since the word Peridot in ancient times meant sun. 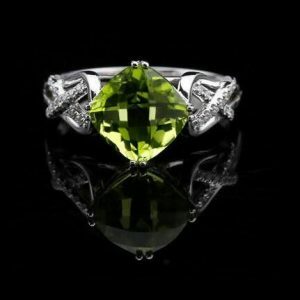 In fact, a beautiful green color of the Peridot often tends to turn towards a golden yellow. The history of the Peridots started long before the birth of Christ. According to the tradition, this Gem is usually given for the sixteenth wedding anniversary. 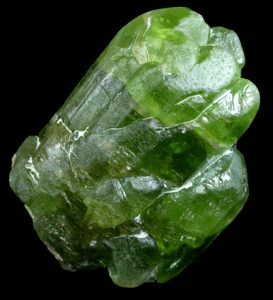 The only known ancient source of Peridot is Zabargad (then called Topazos) Island, off Egypt’s southern Red Sea coast. There are many stories about that island that passed down through generation. Its persistent fog has always made it hard for sailors to reach it. It is said that 1500 BC the inhabitants of Zabargad Island were forced to mine day and night. The miners collected the Peridots of the best quality for the Pharaoh’s treasury. As there were no graduated gemologists from the Gemological Institute of Genoa among the ancient Egyptians, at first, the Peridots were exchanged for Emeralds. Now some historians consider that Cleopatra’s legendary Emerald jewels were in fact Peridots. But beautiful queen could be comforted by the fact that many gemstone dealers of that time ran into the same kind of error. For centuries, men believed that a Peridot to be an Emerald, since there were no current knowledge and gemological methods. There were numerous European cathedrals adorned with Peridots of various sizes. Unfortunately, the wars and plunder led to the fact that many gemstones have been lost. With the advantage of hindsight we now know that the columns of the Three Holy Kings church in Cologne, Germany, are studded with 200 Peridots and not 200 Emeralds as it was believed until recently. Peridot is still the National Gem of Egypt. Peridot Gemstone was nicknamed the “evening emerald.” In fact, the best Peridot looks like the Emerald, but only in those rare cases when it appears in shades of intense pure green color. Along with Diamond, Peridot is the only other gem that is formed in the Earth’s mantle. In fact, in those historical moments when the Earth’s crust opens, the rocks from the mantle are pushed upwards transporting the Peridots contained in the body of rock. This also helped to fuel numerous legends. Peridot Gemstone mounted in yellow gold is believed to become a true talisman, especially when worn on the right arm. Miners find it in the form of irregular clusters of crystals in the strata of hardened volcanic lava or in the rock fractures. The latter are of better quality than the basaltic ones. In addition to Egyptian source new Peridot mines have sprung up throughout the world. The most productive are mines in Norway, Arizona, Mexico, Oregon and Russia.